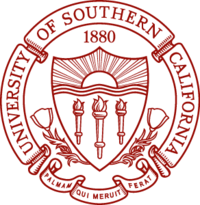 The University of Southern California (commonly referred to as USC, SC, Southern California, and incorrectly as Southern Cal), is a private, nonsectarian, coeducational research university located in the University Park neighborhood in Los Angeles, California, USA. USC was founded in 1880, making it California's oldest private research university. U.S. News & World Report ranked USC 27th among all universities in the United States in its 2008 ranking of "America's Best Colleges", also designating it as one of the "most selective universities" for admitting 21% of the 35,809 who applied for freshman admission in 2008. According to the 2007 freshman profile, 18% of admissions were associated with legacy preferences. USC was also named "College of the Year 2000" by the editors of Time and The Princeton Review for the university's extensive community-service programs.USC students hail from all 50 United States as well as over 115 countries. USC men's and women's athletics have won 88 National Collegiate Athletic Association (NCAA) championships,third in the nation (behind UCLA and Stanford), and 347 Individual NCAA Championships, second in the nation. Located in Los Angeles, a global center for arts, technology and international trade, the University of Southern California is one of the world’s leading private research universities. USC enrolls more international students than any other U.S. university and offers extensive opportunities for internships and study abroad. With a strong tradition of integrating liberal and professional education, USC fosters a vibrant culture of public service and encourages students to cross academic as well as geographic boundaries in their pursuit of knowledge. Los Angeles was little more than a frontier town in 1880 when USC first opened its doors to 53 students and 10 teachers. 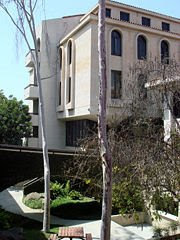 Today it is a world-class research university, the oldest private research university in the West. USC's University Park campus, located in the heart of Los Angeles' Downtown Arts and Education Corridor, is home to the USC College of Letters, Arts and Sciences and many professional schools. The Health Sciences campus, northeast of downtown Los Angeles, is home to the Keck School of Medicine of USC, the School of Pharmacy, three major teaching hospitals and programs in Occupational Science and Occupational Therapy, and Biokinesiology and Physical Therapy. USC also has programs and centers in Marina Del Rey, Orange County, Sacramento, Washington, D.C., Catalina Island, Alhambra and around Southern California. Childrens Hospital Los Angeles, staffed by USC faculty from the Keck School of Medicine, is often referred to as USC's third campus. When USC opened in 1880, tuition was $15.00 per term and students were not allowed to leave town without the knowledge and consent of the university president. The school had an enrollment of 53 students and a faculty of 10. The city lacked paved streets, electric lights, telephones, and a reliable fire alarm system. Its first graduating class in 1884 was a class of three—two males and female valedictorian Minnie C. Miltimore. USC was founded by a Methodist horticulturist, an Irish Catholic pharmacist and a German Jewish banker. The university is no longer affiliated with the Methodist Church, having severed formal ties in 1952. The colors of USC are cardinal and gold, which were approved by USC's third president, the Reverend George W. White, in 1895. In 1958 the shade of gold, which was originally more of an orange color, was changed to a more yellow shade. The letterman's awards were the first to make the change. 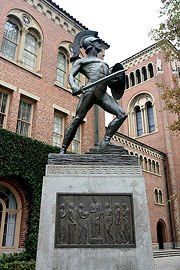 USC's nickname is the Trojans, epitomized by the statue of Tommy Trojan near the center of campus. Until 1912, USC students (especially athletes) were known as Fighting Methodists or Wesleyans, though neither name was approved by the university. During a fateful track and field meet with Stanford University, the USC team was beaten early and seemingly conclusively. After only the first few events, it was statistically impossible for USC to win; however, the team fought back, winning many of the later events, to lose only by a slight margin. After this contest, Los Angeles Times sportswriter Owen Bird reported that the USC athletes "fought on like Trojans," and the president of the university at the time, George F. Bovard, approved the name officially. USC is the largest private employer in Los Angeles and the third largest in the state of California and is responsible for $4 billion in economic output in Los Angeles County; USC students spend $406 million yearly in the local economy and visitors to the campus add another $12.3 million. USC is ranked 27th among national universities by U.S.News & World Report 50th among world universities and 39th among universities in the Americas by Shanghai Jiao Tong University, 119th worldwide by The Times Higher Education Supplement, 24th among national universities by Washington Monthly and 23rd among national universities by The Center for Measuring University Performance. USNWR ranks USC's School of Law 18th,Marshall School of Business 21st, Keck School of Medicine of USC 36th in research and unranked in primary care, the Viterbi School of Engineering 21st, and the Rossier School of Education 38th, and the Roski School of Fine arts Graduate program 37th, the School of Policy, Planning, and Development 7th. The Institute of Higher Education at Shanghai Jiao Tong University ranked USC's combined departments of engineering and computer sciences as 11th in the world, physical sciences 52nd, social sciences 35th, life sciences 51st, clinical medicine and pharmacy 47th. USC is also among top 10 dream colleges in the United States. Princeton Review's "College Hopes & Worries" 2008 survey reports USC as the 9th dream college for students. USC also participates in the National Association of Independent Colleges and Universities (NAICU)'s University and College Accountability Network (U-CAN).